The irrigation system still a work in progress. The 72-foot greenhouses at Veggielution are impressive structures that play a crucial role to the community farm through the continual propagation of fresh, local produce. The greenhouses were built so seedlings and young plants could receive the protection and care required to continue the growth of the farm. Recently, Veggielution has begun a project to install an irrigation system in the greenhouses that would save time for the workers to devote to other projects and minimize water usage to remain environmentally conscious. Will and Mika took on the design of the greenhouse irrigation system by comparing various sprinkler systems and choosing the best one to fit the buildings. They took their chosen system and modified it to meet the needs of both greenhouses. The City of San Jose was helpful during the design process by providing examples and modifications of sprinkler systems to compare. Will and Mika kept in mind the goals of minimizing water loss and reducing the watering time requirements when modifying the sprinkler system. Their design allows the micro-sprinklers to throw water up to three feet so that the three lines of sprinklers per greenhouse can cover the three rows of tables in each greenhouse. 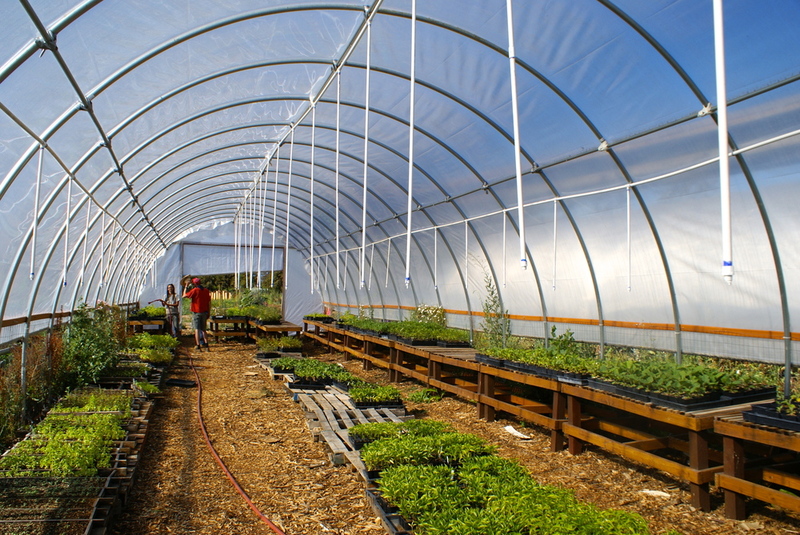 The greenhouse irrigation project was funded by a Patagonia grant of $4,000 for infrastructure development. Michael Burt was also instrumental for jumpstarting the project and was responsible for much of the funding as well. Workday leaders, Todd and Bryan, contributed much of their weekend time to the irrigation system by leading Saturday volunteers through the construction process. The greenhouse irrigation system may have been started by a few individuals, but became a group project with staff and volunteers contributing much of their time and resources. The irrigation project will be a beneficial system to continue the goals of Veggielution of bringing the community fresh fruits and vegetables for many years to come.